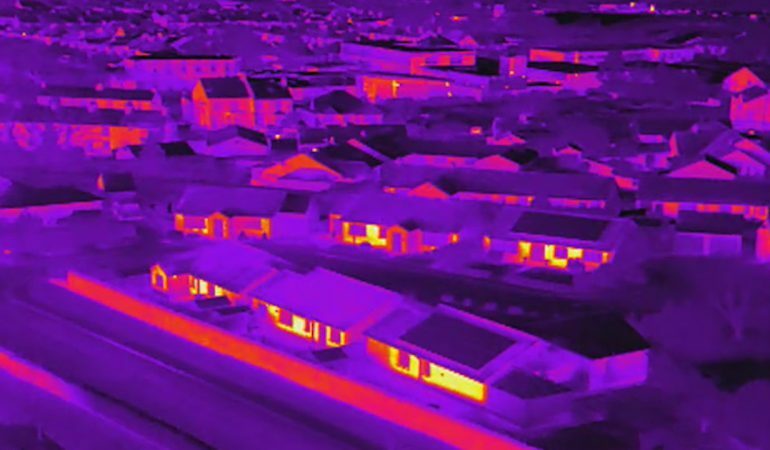 Heat loss is a major concern for every homeowner, no matter what kind of property they live in. 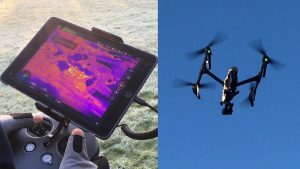 The more heat lost, the higher you’ll have to crank up the heating – leading to unpleasantly pricey bills if you want to keep your toes toasty. 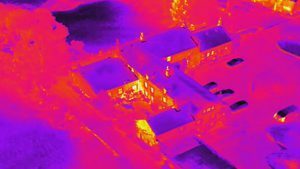 Knowing the hotspots for heat loss in your house is key. 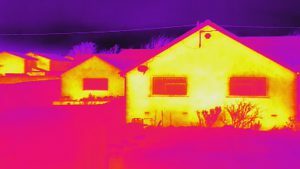 Every single home is different – not only does age and design influence a property’s ability to maintain heat, but the occupants inside can also have an effect. However, all’s not lost – there are many areas you can tend to in order to keep the heat in and the cold out. As you can see, red, orange and yellow areas indicate where a considerable amount of heat is being lost. The most frequent tend to be windows, doors, chimneys and roofs – let’s take a look at how you can tackle the problem in your home. 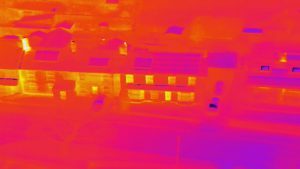 Looking to reduce heat loss in your home? The first place to check is your home’s windows – what kind of glazing has been used? Glazing with an energy rating of B or lower will lose more energy than it creates over the course of a year, letting heat escape from your home. Single glazing has a notoriously lower energy rating than double or triple glazing, and an immediate replacement is recommended. 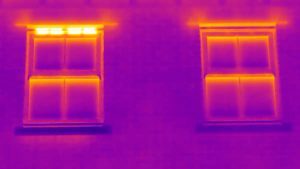 Windows with an energy rating of A or above, however, will ensure no heat is lost. Here at Anglian, we only sell double-glazed and triple-glazed windows that boast energy ratings between A and A++ – promising to keep your home warm even in the winter. If you’d like to know more about the difference between double and triple glazing, head on over to our Windows Buying Guide. It’s not all about the type of glass used, though. The quality of the material used for your windows frames, and the quality of the fitting, can make a huge difference. If you can see signs of damage, such as warping or rotting, you should replace your window frames immediately. Even if you choose triple glazing, a badly fitted window with a low-quality frame won’t keep in the heat. Small everyday changes can also help to reduce heat loss too, such as closing your curtains. Curtains act as a barrier, keeping the cool air out and the warm air in, and it’s important to make sure they’re closely fitted to the wall or window frame for the most effective results. Heavily lined curtains will do a better job – just double check they’re not hanging over a radiator and blocking heat from entering the room! Similar to windows, your doors should show no signs of damage if you want to ensure they’ll do the best job possible and prevent heat loss. uPVC, wooden, composite and aluminium doors are all highly efficient, particularly when you invest in a quality door created by expert craftsmen like those sold at Anglian. However, the smaller features of your door can have an impact on its ability to prevent heat loss. If any glass has been used, make sure it has an energy rating of A or above – if not, the same heat loss issues as previously mentioned will windows will occur. As a general rule, the less glass used, the better in a door. Older doors may be susceptible to letting in drafts – if you find this is the case, yet you’d like to keep the door itself, consider a draft excluder. Don’t ignore keyholes and letter boxes either. Prone to drafts, purpose-made covers for keyholes can reduce the issue while investing in a letterbox flap or brush can keep chilly breezes at bay. Even if your roof does have insulation, it may need upgrading. The recommended depth for blanket-style roof insulation (such as glass and mineral wool) is 250 to 270mm. This recommended depth has increased in the past few years – previously it was 200mm, and before that 100mm. If you have an older home, you may not have enough roof insulation effectively prevent heat loss. Just like roof insulation, poor wall insulation can also affect your home’s ability to maintain heat. While prospective buyers will check the specifications of a property’s wall insulation before making a purchase, sometimes issues can still occur. 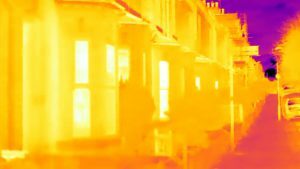 Badly fitted insulation, for example, can begin to cause problems or dated insulation may not be as effective as it was when first installed. If you’re experiencing issues with heat loss even after checking your doors and windows, it may be worth hiring a professional to check the quality of your internal and external wall insulation. While focusing on preventing heat loss in the home, it’s important not to forget about air quality. Particularly in winter, a lack of fresh air and an increase in central heating can cause a major reduction in air quality – making it stuffy and dry. Make sure some fresh air enters the home daily, by opening the windows for a short period of time. Consider an air purifier too, check any vents in the home are working correctly and don’t underestimate the power of houseplants – many, like foliage plants, are fantastic for helping to keep the air in your home fresh and clean! Put a stop to heat loss, and check your windows, doors and insulation. With just a few improvements, you could transform your home’s ability to maintain heat – promising cosier winters and lower energy costs.